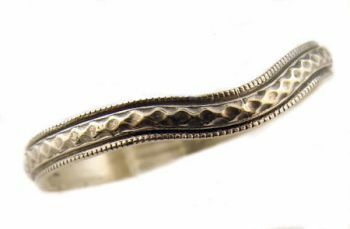 Description: A vintage inspired 3.0mm curved wedding band with a reticulated pattern, curved to fit most single stone rings. This band is narrow enough that it can be fitted to adjust the curvature for a close fit. 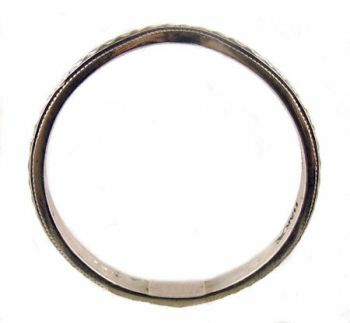 Best for wide curved style rings. This setting is a replica of a vintage wedding band. 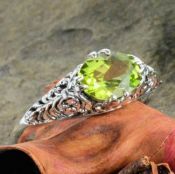 They are not mass produced and are cast per order using molds of actual antique rings or original hand carved dies. The rings are made to appear exactly as their authentic counterparts did a century ago. The pattern is intricate with embossed details or millgrain edging. Measurements: Measuring 3.0mm in width. Manufactued in ring size 11. Resizing is available but will add a few extra days to shipment.